Low Acidity Salad Recipes, Low acidity Indian salad recipes. These healthy, colourful and crunchy-munchy salads are perfect to start any meal! Toss up these Salads without much effort and beat Acidity in a delicious way. Salads are a very thoughtful addition to the meal, because they keep you full in a more natural way. You can also try salads with sprouts as a mid-afternoon snack. If iron is lacking in the diet, iron reserves of the body are used. Once this supply is depleted the formation of hemoglobin is affected. This means the red blood cells cannot carry oxygen needed by the cells. When this happens, iron deficiency occurs and anaemia results. Beets are a fairly good source of Iron provided you consume a minimum of 1 cup of chopped or grated beet. Enjoy this healthy Beetroot and Dill Salad. Carrots have the nutrient Beta Carotene which is a form of Vitamin A, helps prevent deterioration of the eye as one gets older and prevents night blindness. Sadly in India, poor rural families who don't get enough Vegetables like carrots have high incidence of blindness. This is easily preventable if carrot is regularly included in the diet. You must try the cabbage carrot and lettuce salad. Being low in sodium, apples are good for hypertensives. Since they have to consume low sodium foods, apple is a great option for mid-morning or evening snacks. The fruit is also effective against high blood pressure because of its diuretic effect. Enjoy our minty apple salad recipe for lunch. 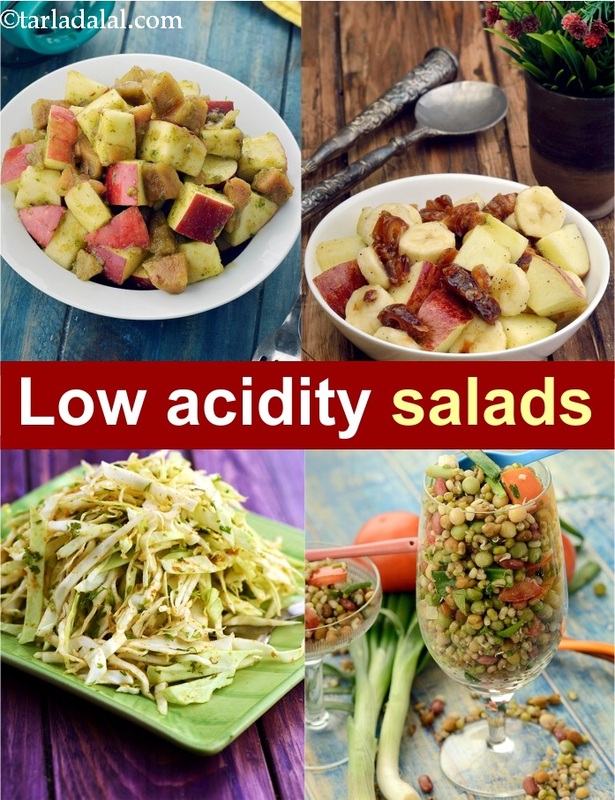 Enjoy our Low Acidity Salad Recipes, Low acidity Indian salad recipes and other acidity articles below.